JOE DeGUARDIA/STAR BOXING: I want to welcome everyone; we are really pleased that we are going to be featuring Cletus Seldin against Roberto Ortiz with Golden Boy Promotions at the fights on November 11 at the Nassau Coliseum. We congratulate Eddie Hearn on a very exciting triple header and certainly it is always great to be back on HBO, the premier network in boxing and certainly to be at the Nassau Coliseum when we have been so active in Long Island. Seldin v. Ortiz is the type of fight that’s a throwback to the 1920′ and ’30’s – it’s the heart of boxing when you have two guys that are bangers and punchers coming forward and coming after each other and fighting the way fans like to see. I’m really looking forward to this night. ROBERT DIAZ/GOLDEN BOY PROMOTIONS: Like Joe said, we are excited, we are on the No. 1 network and it’s a can’t miss. It’s a can’t miss because of their styles. Ortiz, you have seen him, he tried to get on the fight with Orozco and we all know what happened there but now he is given another opportunity against an undefeated fighter and a win here . . . they know what a win here at this level means for both fighters. It’s a make or break. They are coming in for the bigger fights and they have to go in there and perform. Joe we are looking forward to working with you and we are ready. ROBERT DIAZ: Everyone, with a record of 35-1, 2 draw, 26 knockouts, Roberto “El Massa” Ortiz. ROBERTO ORTIZ: I am very excited. I am very grateful for the opportunity that HBO, Golden Boy, my co-promoters Cancun Boxing and Pepe Gomez, my manger Memo Rocha has given me. I’m very excited for November 11 and the opportunity that brings me. JOE DeGUARDIA: What a tremendous fight. You have a guy that’s 35-1 with 26 knockouts fighting against a guy that’s 20-0 with 16 knockouts. This is really what boxing’s about – two exciting styles and I’m very pleased to introduce Cletus Seldin. You heard Eddie Hearn earlier speaking about character and personality – this guy is really a throwback to the heart of the Jewish fighters – the kind of character that he’s got – the trunks and jacket and he’s a fighter. He’s a Long Island fighter, undefeated, built up at The Paramount where we’ve been so successful in creating guys like Chris Algieri, Joe Smith and now Cletus Seldin. He’s going to be our next big star – he’s graduating from The Paramount and now fighting at the Nassau Coliseum on HBO. He’s been packing them in at The Paramount, he’s very exciting and I’m very pleased to announce and introduce Cletus “The Hebrew Hammer” Seldin. 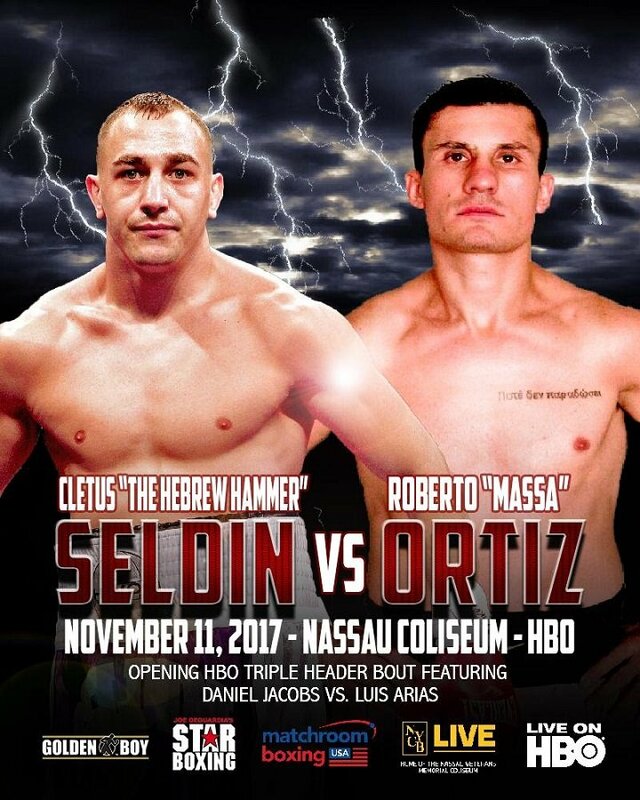 CLETUS SELDIN: Hey guys, Cletus here, I am so excited, so pumped, so ecstatic to be involved in this particular fight at the Nassau Coliseum. It’s literally going to be two gladiators fighting – two warriors – and we are fighting for it all. We all know what’s at stake and we are putting everything towards this. I literally went from one fight, took a week off, then went into this fight. I jumped on it with smiles, I didn’t even know who the opponent was, I just couldn’t wait to get in the ring and fight again. I am excited and I am ready to bring every single thing that I have into this fight. I am training currently in West Palm Beach, Florida with Pete Brodsky again and we have what it takes to take it to the next level and I am going to guarantee an action packed fight that will most likely end before the ten rounds. What does it mean, as a Long Islander, to fight at the Coliseum? CLETUS SELDIN: Being, literally, a Long Island person, I’m literally putting everything I can into moving forward and for me to be a part of Star Boxing and this being our first time out – I am taking this to the next limit. I don’t even know what the amount of tickets that will be sold (to my fans) – probably 700-1000 tickets. It’s incredible. People are buying and I am really impressed on the outcome of that. Moving forward, right after this fight – considering that Orozco and Ortiz were supposed to be almost a title-eliminator kind of fight, I believe that our next step would be in that direction. If this is a title eliminator we could go after Crawford or any of the titles that have been vacated or whatever is going to be out there. So that is definitely on my mind. When you win the title will you feel as though you are representing the Jewish people? CLETUS SELDIN: Absolutely, I come in the ring wearing the Star of David on my trunks. On the back of my jacket it says “Remember the Masada.” My trainers, my managers, they are all Jewish and I’m like ‘the guy’ because there aren’t that many Jewish athletes in professional sports today and for me to be a part of boxing and be able to speak my mind the way I want to is by far one of the greatest gifts that I could give back to the Jewish community. I have been going to the concentration camps events. I do ribbon cuttings with concentration camp survivors. I go to all of these little events on Long Island to help support and to push the Jewish boxing name that I have right now. I love it because a lot of the kids, Jewish kids, they don’t know that there are professional boxers out there – we are all supposed to be doctors and lawyers and I have been pushing on that. Boxing is like life – everyone knows that – it’s a fight – so there you have it. What part of Long Island did you grow up in and have you fought at the Coliseum before? CLETUS SELDIN: I have not fought at any level at the Coliseum. The only time I have been there is for a Comic Con – I like nerdy stuff. I haven’t been in that venue yet but to me it’s just another fight where I come in and I am a wrecking machine, just like every other one. You guys have seen my fights – that’s exactly how I fight and how hard I punch. CLETUS SELDIN: I grew up in Shirley, New York on Long Island. I went to Longwood High School and going to high school there was only three or four Jewish guys, so we are all friends and we all know each other and I love that we still have that relationship. How forward are you looking to fighting a guy that has fought top notch fighters in his career? CLETUS SELDIN: Every day I wake up so happy because this is where I wanted to be in my career. I am 20-0 right now and I am ready to make that next step and everybody who watched my fights and watched me get built up knows it’s time. I always get the question ‘when is the time?’ It actually came now and it came at the perfect time because I just fought and I am in great shape and I am ready to put on one of the best shows that HBO is going to have that night. I always say it, whether I am the first fight or the last fight, my fights are always the best fights. CLETUS SELDIN: Actually it doesn’t give me any motivation because I know how much work and effort I put into each fight. It doesn’t matter if I’m fighting a guy like Renald Garrido who I just fought – he was 19-15 but he was able to fight. All the other guys were good fighters but I just make sure that I train as if it was always a world championship fight or a main event or a televised fight on HBO. I have been going to training camp since the first fight of my entire career so I am used to knowing what hard work is. How much has Algieri and Smith inspired you – as they went from The Paramount to the high levels? CLETUS SELDIN: Absolutely – seeing those guys get there, New York state had that issue with their insurance policies – I just kept telling myself ‘don’t sorry about it, just keep working hard because it is going to happen, Star Boxing has done it before multiple times so don’t stop.’ I just continue to never stop training and I wasn’t going to wait until a bigger fight was going to come. Even afterward, we may be back at the Paramount because I want to stay busy – I want to stay active. I really don’t want to fight three or four time, I want to fight six or seven times a year. That’s the kind of stance that I want to take in my career. How far is the town that you grew up in from the Coliseum? CLETUS SELDIN: It’s about an hour ride. I live in Middle Island, Suffolk County – I live right in the middle. I remember going there as a kid – going to the circus, seeing some hockey games – it was like a little family vacation for my family. What kind of challenge do you think Cletus will present to you? ROBERTO ORTIZ: I know he’s a strong fighter. He moves forward. He is aggressive. I know he’s hungry for a victory, but you know what? I’m hungry too. I’m actually hungrier than him because of all the work that I have put in over the years that all that has gotten me here to get this opportunity and I’m not going to let it go. You will see on November 11. You have been having open training sessions with the fans and the kids – since the two fights are so close together will you be able to do that? CLETUS SELDIN: Yes we are, we literally just committed to it just a few hours ago. It is pretty much a new tradition that we do for the fights, we have a little open workout in Riverhead, my hometown, and people and all the kids come in there and we work out with them and show them stuff. I always get messages on Instagram and on Twitter of people posting a sharing that their kid is now going into boxing three days a week and it is definitely one of the better parts of finishing out the training camp. JOE DeGUARDIA: Let me just add to that – Cletus has a real busy schedule the week of – we are going to be doing a Long Island event on Tuesday, we have fighter workouts on Wednesday and Thursday is the press conference and Friday obviously the weigh-in and I specifically spoke to Cletus and said you know you are going to have a busy schedule – are you sure you want to do this thing you do every Saturday before, and he said ‘absolutely, I’ve got to do it for the kids and I still want to do it,’ so he is going to do the open workout on Saturday for all the kids at the gym. CLETUS SELDIN: I grew up in Shirley and I moved to and currently live in Bayshore so it’s about an hour ride from Middle Island to the Coliseum. How did MMA prepare you for boxing? CLETUS SELDIN: My entire athletic career prepared me for boxing – it’s the one thing I have an advantage of over every single person that walks into a boxing ring. I played football, I was a body builder, wrestled, and I started doing MMA before these other boxers. You can’t teach to the other boxers what I have – I am a strong, strong human being that nobody will be able to find at 140-147 pounds, in this entire world, that can punch, take a punch and knows strategy like myself. Seldin Vs. Ortiz is presented by Golden Boy Promotions in association with Joe DeGuardia’s Star Boxing. Jacobs Vs. Arias and Miller Vs. Wach are presented by Matchroom Boxing USA, in association with Brooklyn Sports & Entertainment, Salita Promotions and Roc Nation Sports. The event takes place Saturday, November 11 at NYCB LIVE, home of the Nassau Veterans Memorial Coliseum and will be televised live on HBO World Championship Boxing beginning at 10:00 p.m. ET/PT. BROOKLYN BOXING on Long Island is an extension of BSE’s BROOKLYN BOXING™ brand. For more information, visit brooklynboxingshop.com. SPECIAL OFFER: Use Code: SELDIN through the Ticketmaster link below to waive all Ticketmaster fees and unlock tickets in the #HammHead Cletus Seldin Fan Zone! Tickets for the live event are on sale and can be purchased at ticketmaster.com, NYCBLIVE.com or by calling 800-745-3000. Tickets can also be purchased at the Ticketmaster Box Office at the Coliseum.